The stands are packed at the Coussoulis Arena on Pack the House night. Supporting athletes on their game days is something that can be a decisive factor when it comes to victory or defeat. Student support so far has been very timid when it comes to game days, which perhaps affects in some of the athletes’ games. Men’s and women’s soccer both advanced to the playoffs this past season after both performing better than expected. Women’s volleyball had another outstanding season, winning the conference and making the regional semifinals. As a whole, our athletes are trying to get the backing of the students to come down to watch the games and support the ‘Yotes. “Fans showing up to the game is always a bonus, because not only does it put pressure on the opposition, but it motivates us more throughout the game,” mentioned men’s soccer player Nic Turkington. Attending men’s soccer games is free for fans who have their Coyote ID. Doing so helps the team with their home advantage. “It helps create a better playing atmosphere, and it can give the players an extra lift to see games out till the end of the game,” said Ross McGuigan, of men’s soccer. When the home team has fans at their games supporting, it is intimidating for the away team—it could potentially be the difference of a win or loss. 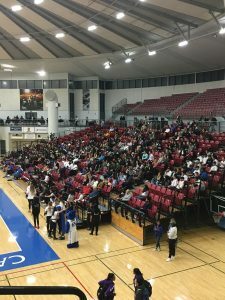 When it comes to sport, athletes want to play in front of as many people as possible because it makes the game and overall atmosphere more exciting. “It helps the team stay positive and motivated. To know that despite winning or losing, the team has a loyal fan base is vital to a team’s success,” said Alyssa Campa, of women’s soccer. No matter what is happening in the game, fans help bring passion to the game. It encourages players to never give up and reminds them that they are not just playing for themselves but the university, too. Athletes for CSUSB have all agreed that they want to see more fans supporting all of the sports offered. They are looking to improve CSUSB’s Athletic Department by increasing their teams win to game ratio, through an increase of support. Teams playing in the near future include men’s and women’s basketball, as well as baseball. If you know some of the players on the team and don’t actually attend the school, you are able to speak to them to ask for free tickets to the game. If one is not a CSUSB student, faculty or staff but would like to attend a game, free tickets may be available. If you can support any of these games, it’s time to cheer on our Coyote athletes. Men’s and women’s basketball have their next home game on Feb. 3 and 4. While baseball will have their opening weekend against Dixie State on Feb. 3, 4 and 5.